Finding your board in choppy water. Yesterday I was out and the chop was fairly large, gust come through and lost my board. I looked everywhere for the board but couldn't see over the choppy water and had to body drag in. I got it back several hours later . Is there something I can use that is known to work well which will make finding it easier, maybe the guys that go out in the surf have any good techniques on finding it quickly. Always had brightly coloured boards for this reason. Bright coloured fins help too. Not crashing helps a lot. In the surf the wave usually takes the board with it & I sort of "body surf" after it on the next wave's white water. Seems a bit quicker than immediately dragging & your boardies don't end up round your ankles. Losing it behind the waves the board's almost always upwind of me so if I can't see it over my shoulder I'll just focus on 3 or 4 really strong body drag tacks (pretend you're a rudder ) then as nikmcc said boost yourself & look around. That's just my way though, might be location specific with different currents & whatnot. Thanks lads, I made this and am going to give it a try. No wind today but tried on the flat water, it tips back over from 2/3 of the way over but not completely upside down, in the chop I'm confident the waves will make it flip over if not 1/3 of the bottom sticks up so should make it more visible either way. OMG.... Here we go again. We have had tyre tubes, little flags, rubber rings and blow up dolls. Buddy just don't do it. This is one of those decisions that will affect your reputation at your local for life. You will never live it down. Trust me, just look at previous posts. 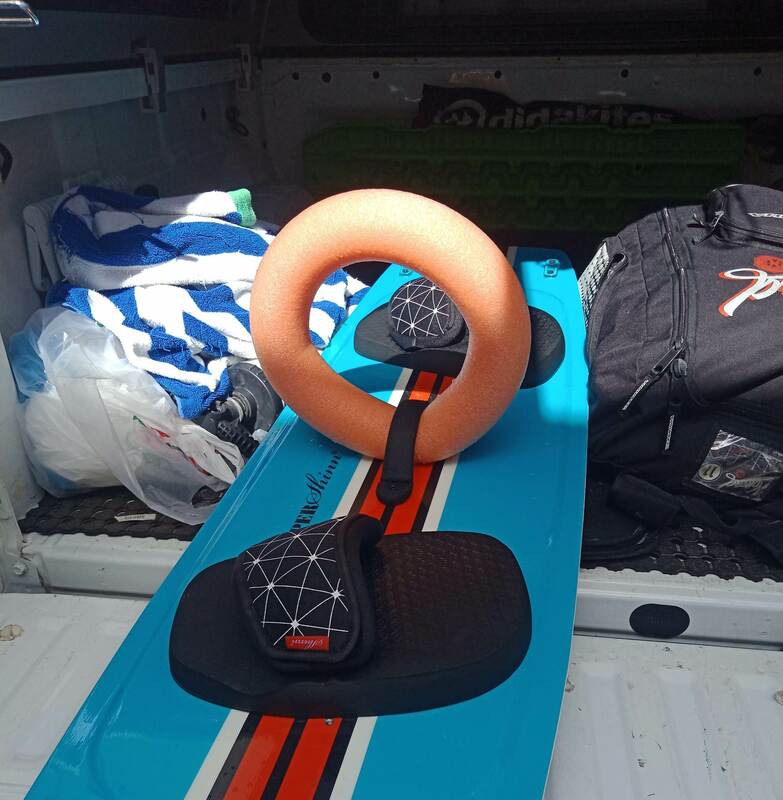 With that self righting floatation device (above) you can expel your excitement once you have found and retrieved your board. I only have choppy water to kite in so I have a few tips that might help without strapping stuff onto your board. If you aren't kiting alone - look at the other kiters around (upwind). I'll typically point out a board to its owner (unless they look like they aren't in a position to recover it) and I think many would do similar so that may help if you lose any bearings on it. I also tend to look behind me to where I thought I dropped it as I start to body drag away. If you just roll a little further over in the water onto your back you can normally spot where the board is before you get too far away in the first place. That way you can gauge how far away you have dragged before you turn around. I'd prefer to lose my board than my dignity. Tip two - if you are close-ish to shore, go to the beach and look from there. At my local in the surf, it's often the easiest way. Then when it's spotted, make sure you're well upwind of it and just power body drag straight at it. My board never falls off! Just get one of those gojoe inflatable things. Bright colored fins like shinn Bite are yellow and really stand out if your board is inverted. Look nobody can really give you advice. Over time you learn to estimate when your board will be in relation to how big a wipe you take. I only ever need two bodydrag tacks to get back to my board and soon enough it'll be second nature for you also. Anybody can give him advice - You did! What dextrous said. I just instantly start body draging upwind on the opposite tack cos stopping to think or look around is more meters you've drifted away from yr board. It can be different if a wave takes it but either way you're better off being up wind of it so may as well start dragging upwind while you look. And you do gain a sence of where it will be after a while.